It can't be helped. 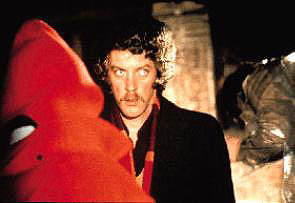 When I see a little person in a red hooded cape I think I'm in 'Don't Look Now' (1973). Unsurprisingly, it's not something that happens often, but when it does, it produces such a powerful association that it suddenly transforms the reality I'm in into an eerie, unsettling alternative. I went with a friend to Kokkino Limanaki for the first swim of the summer. The sky was slightly overcast, the beach full of people. As we were drying off after our swim, our soundscape included airplanes, a bunch of guys discussing their eating habbits and the business calls of a wedding planner who had brought work and a filofax on the beach, on a Sunday. Normal, everyday people, having mundane conversations, while getting some sun. And then it all changed. Without any music prompts. I could just see it out of the corner of my eye. Then I turned and there it was. A little person with a red cape on the beach. It became instantly obvious that a killer was among us and something terrible was going to happen. The face of the little person was carefully concealed by the hood. I couldn't tell if the little person in the red hooded cape would be the victim or the perpetrator. I looked around me, nobody seemed to have noticed. 'Run for your lives!' I wanted to shout at them. 'Can't you see there is a little person in a red hooded cape on the beach? Don't you know your cinematic symbolisms?' Apparently not.